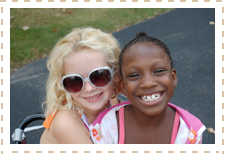 The Fresh Air Fund is again looking for host families in the Northeast U.S. and Canada to provide "summer vacations" for disadvantaged children living in New York City. The Fresh Air Fund is a non-profit organization that has developed a two-week summer vacation program for inner-city youth. To learn more about being a host family, click here. To learn more about signing up your child, click here. Labels: Natural World, poverty, U.S.